Does Job 19:25 Predict a Resurrection of the Flesh? In our first installment in a brief examination of Job 19:25 we examined what Job had to say in other texts about the idea of resurrection. There is no reference whatsoever to a raising of the body. (Interestingly, the Hebrew language does not have a word for “body”). No allusion to, or prediction of the raising or restoration of the flesh. Instead, Job, when speaking of his death, said repeatedly that he would die “and not return.” This is hardly suggestive of a belief in the resurrection of the flesh! The absolute most that can be said– and this is only implied by Job– is that God would one day vindicate Job’s suffering. In spite of this, it is common for Bible students to appeal to Job 19:25 for proof that there will one day be a resurrection of the flesh. After all, didn’t Job say: “In my flesh I shall see Him”? Well, actually, most probably not! The reality is that there are some huge– I would say insurmountable– issues with appealing to Job for proof of a future resurrection. To say that the translation of Job 19:25 is difficult, obscure and uncertain is to make a huge understatement. And this is attested by history’s greatest Hebrew linguists. There is a wealth of information that illuminates the translational problems in Job, if a person is willing to open their minds to it. Keil and Delitszch are recognized as some of the finest Hebrew scholars in church history. Here is what they had to say about Job 19:25, after discussing the translational difficulty: “We cannot find in this speech that the hope of a bodily recovery is expressed.” (Keil And Delitzsch, Vol. 4, 356f). Albert Barnes is likewise recognized as a great Hebrew scholar. Commenting on Job 19:25 he said: “The literal meaning is ‘from, or out of, my flesh shall I see God. It does not mean in his flesh, but there is the notion that from, or out of his flesh he would see him; that is clearly, as Rosenmuller has expressed it, though my body is consumed, and I have no flesh, I shall see him….without a body…” (Barnes, Vol. 1, 327f). In modern times, N. T. Wright, commenting on Job 19:25 says– “few scholars today” see Job as a reference to “bodily life after death.” (The Resurrection of the Son of Man, 98). “This verse is riddled with difficulties. AS M. Pope noted in his commentary on Job years ago, ‘the verse is notoriously difficult, The ancient versions all differ and no reliance can be placed any on them. Various emendations have been proposed, bur are scarcely worth discussing. Many Christian interpreters since Origen have tried to read here an affirmation of immortality or resurrection, but without success: Chrysostom quite correctly refuted this interpretation with the citation of XIV 12f” Even a note in the NABRE reads: The meaning of this passage is obscure because the original text has been poorly preserved and the ancient versions do not agree among themselves. Job asserts three times that he shall see a future vindicator (Hebrew goel) but he leaves the time and manner of this vindication undefined. The Vulgate translation has Job indicating a belief in resurrection after death, but the Hebrew and other ancient versions are less specific.’” He then continues discussing Job 14 determining that it does not teach resurrection and then observes: ‘Job 19:25 is never cited in the New Testament as a resurrection text until much later in the Christian era.’” (Resurrection of the Flesh or Resurrection From the Dead?, (CollegeVille, Minn., Liturgical Press, 2013)53-54). I could multiply these kinds of quotes many times over. The indisputable fact is that the translational issues surrounding Job 19:25 are, according to the top Hebrew linguists in history, extremely difficult, to say the least. Is The Translation of Job 19:25 Actually a “Piece of Cake” After All? In spite of this wealth of information confirming the difficulty of Job 19:25, in my July 2012 formal debate with Joel McDurmon of American Vision, he acknowledged the translational issues related to Job 19. However, he then tried to mitigate the severity of the issue by claiming that the translational issues are in fact “a piece of cake” compared to the issues in Daniel 9 for instance. Be sure to get a copy of that debate and read for yourself how tenuous and desperate McDurmon’s claims were, and how he completely ignored my responses. 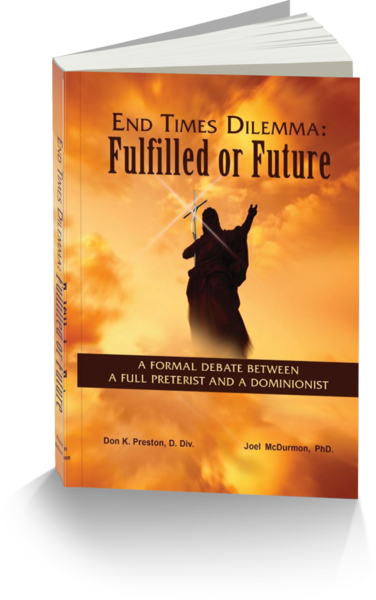 McDurmon Preston Debate in which McDurmon claimed that the translation of Job 19:25 is– in spite of the world’s greatest Hebrew linguists to the contrary– “a piece of cake”! This claim was and is quite stunning. To suggest that the translational issues in Job are “a piece of cake” is to basically discount the entire history of the translation of Job. It likewise discounts what some of the greatest Hebrew scholars who have ever lived have had to say about those translational difficulties. And let me say this, while McDurmon has a doctoral degree, it is not in Hebrew. In short, McDurmon attempted to run a bluff on this entire issue. Did McDurmon examine the actual Hebrew text? No. Did he offer any Hebrew experts to support his claim? No. And of course, he never even suggested that we take a look at the other texts in Job that we have given in the first article which clearly do not suggest the resurrection of the flesh. They indicate no such thing. So, when some of the church’s greatest Hebrew linguistics, men who actually believed in a fleshly bodily resurrection, nonetheless admit that Job cannot be used to support such a doctrine, then it is patently clear that Joel McDurmon was attempting to “run a bluff” to convince the audience otherwise. This is disingenuous to say the least. Keil and Delitszch disagreed. Barnes disagreed. The early church fathers disagreed. Modern scholars disagree. What all of this suggests is that it would be tenuous at best to “hang your hat” on Job 19:25 as proof for a yet future resurrection of the human body of flesh out of the dirt. This concept flies in the face of Job’s earlier statements, and it places that doctrine on the rotten foundation of a translation that cannot be supported. But, there is even more, and we will look at some of that in our next installment.